I started making my own vanilla after I married Darren...... my Angel of a Husband. He enjoys my baking and supports my efforts to keep something sweet on hand during the week. My body is proof of this effort. When I was pregnant with Amelia Claire........ there was always a peach cobbler, cookies, White Texas Sheet cake, brownies, Gooey Butter cake and/or fudge on hand. It has slowed down somewhat since the cravings went aways but ....... it is November after all and it's time to break it all out. And make my vanilla...... and here's how I do it! 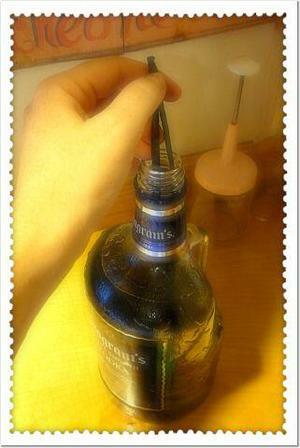 It's one of the very easiest things to do and so much cheaper than buying bottle after bottle like I used to do. First...... I know that you're all calling me "Liar McFat pants" under your breath because I'm claiming that it's cheaper to make it........... than to buy it, and you've all seen the prices of vanilla beans in the grocery store. It's true.... vanilla beans are very highly priced when they are stuck in a bottle on the shelf looking all pretty and stuff. 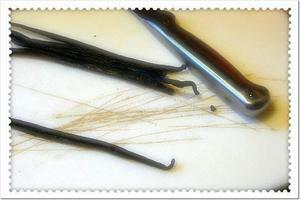 I just went on trusty ole Ebay and bought a crud-load of vanilla beans. They've lasted me a couple of years and are just great. There are two varieties...... I bought the cheaper which is actually suited better for this particular job. You store them in a cool, dry, dark place and they last a long, long time. I put mine in a gallon zip lock freezer bag and rolled them up squeezing the excess air from it and put in in a corner of a dark cupboard. Next..... you'll need vodka. I've used a few types of vodka and it doesn't seem to matter to me much on the brand or "quality". I normally use the smaller bottle of Smirnoff's but this time, my Dad got me a huge bottle at the Navy Exchange for like $15.99........ and I'm loving it! Take your beans and cut them down the center. I leave the top attached and pull the two bits apart a tad. I think this gives the vanilla bean a better chance of perfuming the vodka. 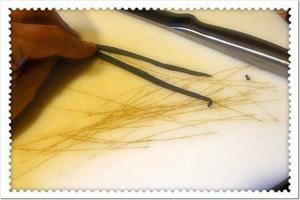 Like this..... see how the beans are a bit sticky and leave pretty smelling "goodness" on my cutting board? Oh yeah! Now, after you slice down the center of about 15 or 20 beans......... drop them down into the vodka. 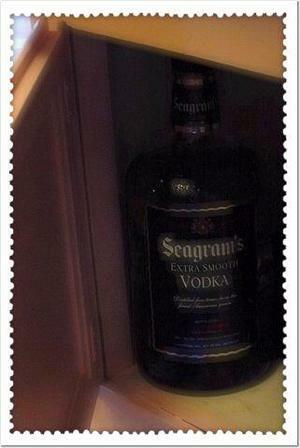 This time I'm using Seagram's Smooth something or other and tons of beans. I'm trying to make sort of a double strength vanilla....... I'm running out of time. Now..... find a cool, quiet, dark and safe place for your new delicious smelling & tasting vanilla. I like to check on it about once a week to give it a turn or two and see the color. It will turn nice and dark brown and the smell will just set you into a tizzy and make ya want to bake something........ anything I tells ya! Are y'all planning on extra baking this season as well? I'm getting my list ready for all the goodies I'll be making too! 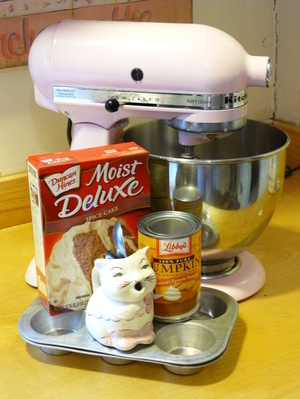 You've got to make this cake. I know it doesn't make one dang bit of sense for me to have two posts back to back........ one about losing weight and one about baking this cake. Just look at it........... see what I mean? To tell you the truth, I made this last weekend before my weigh in and still lost weight. I just didn't eat the whole thing, only two pieces. And it was great! I made a couple changes......... just little ones, like substituting some of the oil with applesauce....... made no difference in taste or texture. It stays moist for days and just gets better and better. 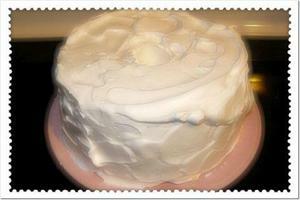 I made this when I was a kid while I was visiting my Aunt Rosemary and family........ she called it "Inside Out Cake". I just call it good. 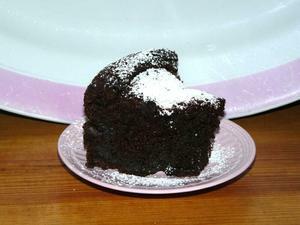 Here's the recipe........ very easy and soooo yummy! Combine cake mix, pudding mix, oil, applesauce, eggs, water, sour cream, and vanilla. Beat until smooth. Stir in chocolate chips. Pour batter into prepared pan. No need to frost. So good! I'll be back tomorrow with pictures of what I have of Amelia's finger killin' quilt. Have a great night Ya'll! Dump both ingredients into your mixer and mix. Stick in a muffin pan....... I line mine with cupcake wrappers to keep from having to wash the muffin pan...... it's a pain you know. Anyhoo......... it should make about 18 muffins and they are 1 point each or there about. They stay sooooo moist and yummy for days! 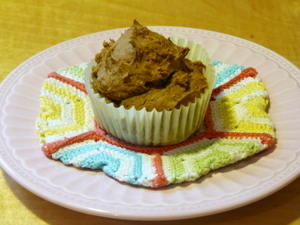 My picky eaters like these and so do I and I'm really not a spice cake person. 1 cup sugar......... yes, a whole cup! You'll need to look at the pictures to get the amounts 'cause I've never measured the water part before. It's really a no-brainer. 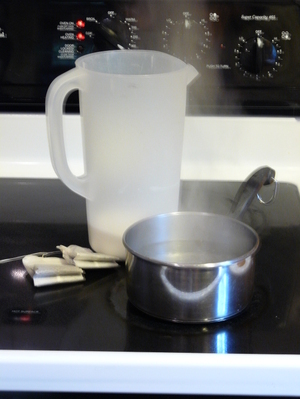 Just fill up a small saucepan with cold water and bring to a boil. 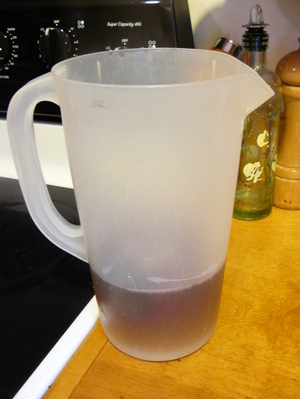 Meanwhile, add the 1 cup of sugar and the two tea bags to the pitcher. 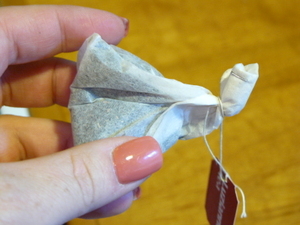 *Note: Fold the top of the tea bag in half and wrap the string around it. This keeps the darn thing from busting open and keeps you from getting stinkin' mad at seeing tea leaves floating around in your glass! Also had Amelia model some more clothes for my Etsy shop. 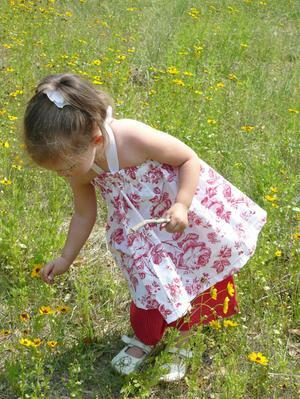 Not an easy task taking pictures of a two year old running in a field then tracking her down, changing her all the while trying to keep her in a happy moood. I was exhausted after 10 minutes. I'm trying to raise money for a Shop Hop that I will be going on with my two sisters, my Mom and Amelia at the end of this month. We'll be going to Florida to visit as many quilt shops as possible in 2 days. This means lots of fabric and lots of eating out a hotel or two. AHhhhhh....... don't it sound like the life? I'm leaving all of my PayPal money alone....... um, maybe, and saving it for the trip. I plan on taking my camera and blogging about each shop when I get back. Soooooo exciting. Anyhoo...... I'm working on some goody bags for my Mom, sisters and even Amelia for the trip. I can't tell what all will be in there 'cause a couple of them read this....... hi Ya'll......... and I don't want to ruin the surprise. But, if you have any ideas as to what to add leave me a comment or throw me an email! I'll welcome any ideas at all! Thanks ahead of time! Got to go cook for my Angel of a Husband who will be home in a few minutes after driving to Tennessee all night last night to bring his Dad home. Enjoy your weekend! It's amazing to me that there is a huge wildfire blazing away just a few miles north of here with it being so sunny and clear right now. Although, if I wait another few minutes and the wind changes....... it's back to smokey and stinky skies. They expect it to burn for a few more weeks. Goodness. This morning I bought myself three yards of this oober yummy fabric to make myself a skirt. 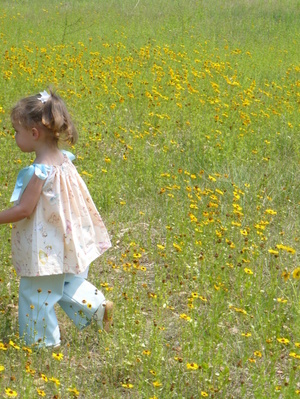 I'm taking part in Skirt Month on Flickr started by Sew Mama Sew. 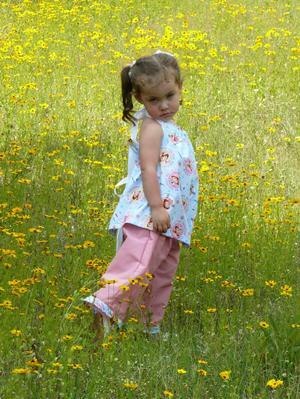 I have also decided to make one out of this fabric Moda Uptown Brown and to go all the way with the skirts, I'm making one from Alexander Henry's Bird Seed fabric too! Whenever I wear a skirt, I seem to feel very girlie and even walk a little different, sit a little different and even think a little differently. I think we get lost in the ease and comfort of wearing pants and forget the fact that we are women. There was a time when women dressed like women allllllllll the time and not just when it was a special occasion as we do now...... or at least I do. Now, not to say all I wear are pants and t-shits, on the contrary. I wear Capri's and empire tops mostly which is more girlie than a plain old t-shirt I guess but, I guess I miss wearing dresses and skirts. I used to work as a receptionist in the Radiology Department at our local hospital and before having to wear scrubs, I wore skirts. My favorite skirt of all time was a long, slender denim drawstring from Victoria's secret with a slit down the back. Man, I wore that thing till it curled up and died. I'm longing for that and will hopefully get it back with this pattern #7229. I'll let you know how they turn out. Here is a recipe I made last night for some bread that I thought was pretty good considering it was so quick and easy to make. 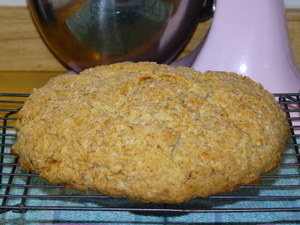 It has no yeast and is pretty much like a biscuit, but with a hint of a sweet and wholesome taste. Great for breakfast too! Enjoy! 1 (8 ounce) container low-fat sour cream, I used full fat! 2. In a large bowl, mix together flour, 1/2 cup oats, salt, baking powder, and baking soda. 3. In another bowl, mix together sour cream, milk, honey, and sugar. Add to the flour mixture, and mix just until well blended. Stir in melted butter. 4. Turn dough onto a lightly sprayed baking sheet. Shape into a round, lightly mounded circle, about 8 inches in diameter. Brush the top of the loaf with melted butter and sprinkle with 1 TBS. oats. With a knife, score the top of the loaf into quarters. 5. Bake for a bout 40 minutes or until browned. Cool completely before slicing. Yup........ that's what I'm doing alrighty. My sister Debi and I made a deal that if I made her a double batch of chocolate chip cookies with my favorite recipe........... she'll watch Amelia Claire this Saturday so I can sew. (Between you and me........ she'd do it for free!). 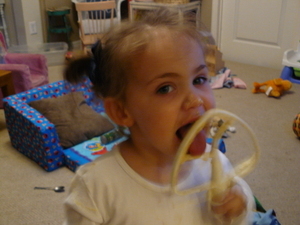 Amelia seems to like the dough best! 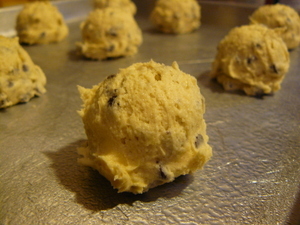 The Best Chocolate Chip Cookie Recipe Ever!! 2 cups mini chocolate chips.... I always use mini as they seem to make their way through the dough better! Preheat oven to 375 degrees. In a mixing bowl, cream butter and sugars. Add pudding mix, eggs, and vanilla. Combine four and baking powder; add to creamed mixture and mix well. Fold in chips. Drop by tsp. or tablespoons onto an ungreased cookie sheet and bake for 10-12 minutes or until lightly browned. ( I like to use a scoop to keep them neat and tidy and also keep them uniform). It was warm & drizzly but so much fun! New Years Eve at my sisters is always spent outside under a string of colorful Christmas lights, with loud music streaming from the studio & food....... lots of it........ piled up high on sheets of wood. There's usually a big fire in the center with chilly people huddled together trying to keep warm.......... except for last night. It was warm and muggy........ ugh! Then it began to rain....... on us and on the food. Needless to say we ended up inside with wet hair, clothes & kids. No problem..... we all found a seat and talked till we just couldn't stop yawning. With my sister & brother with their families and mine with me, plus the company of great friends....... does the weather really matter? Not one bit.... so bring it on! (Just please leave the electricity going!). What does all that have to do with the cookies above? They were my sweet contribution to the party. 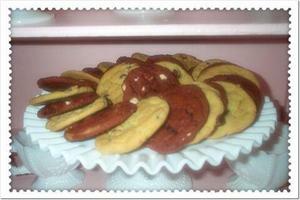 Two kinds of chocolate chip cookies made with a great new recipe I'll share below. It has pudding in the mix. The texture was just the best and gave great flavor. I enjoy baking more than probably anything besides sewing. 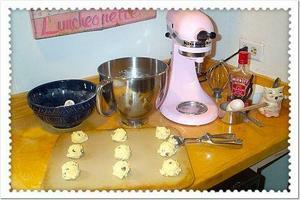 My sweet husband gave me a pink Kitchen Aid mixer for Christmas two years ago and MAN....... have I put the miles on her! I wish they had a mile tracker thingy like on cars, I'm sure Laverne is past due for an oil change! Here she is after giving me her best on the first batch of cookies. I have decorated my kitchen around this fantastic machine. I painted everything white and ordered those awesome pink dishes I've been slobbering over for years. My cookie jars look great and the vintage kitchen toys fit in perfectly. 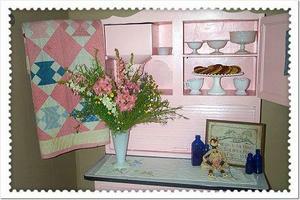 Don't you wish sewing machines came in pink too? If only in my dreams!